One of the most successful series of dashboard cameras so far has been the Chinese “Mini” brand. It started with the Mini 0801, a tiny cam with a 1.5″ screen that had an optional GPS receiver in the mount. The Mini 0801 was a huge success, and shortly afterwards, the Mini 0803 was released, which was capable of recording at a higher video resolution. Mini 0805 and 0806 followed soon, each of them enhancing specifications in their own way. Today, there’s a wide spectrum of new releases in this series: The newer cameras are named Mini 0807, 0826, 0901, 0902, and 0903, and the list will most likely keep growing… Confusing? Yes indeed! Don’t worry though, this article will give you a clear overview of what each of the cameras can do, whether it’s worth buying, and where to order it from for the best price. UPDATE: In 2017, the Mini 0906 was released which is a front and rear dash cam, recording 1080p both ways. Currently priced around $140, it records decent video at day and night, thus making for an exciting addition to the series. To give you an initial overview, here’s a table that allows you to compare the most important features of each of the Mini cameras at a glance. FOV = field of view; C/B: capacitor or battery; CPL: circular polarization lens. Prices are approximate and vary between vendors and over time. All the Mini series dash cams are quite small and discreet; however, they vary in their individual degrees of smallness and discreetness. Mini 0801, 0803, and 0805 use the same casing though and thus they are equal in this regard. All Mini cams have a detachable foot that sticks to the windshield with adhesive tape, and most of them can have an optional GPS receiver in the foot (except Mini 0902 which uses an external GPS dongle). 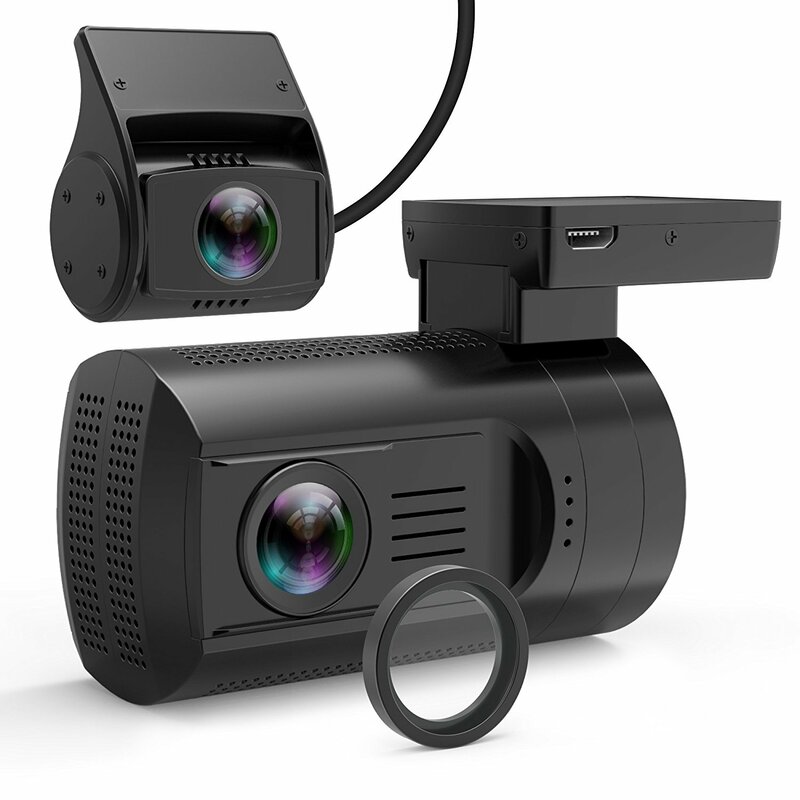 They all can record 1080p video (1920×1080 pixels), and some support higher resolutions as well, namely 1296p (2304×1296 pixels) or 2560×1080 wide screen. All of the cams have a 1.5″ screen, except the Mini 0902 which doesn’t have a screen at all. Most of them have a viewing angle of 135°, with the exception of the Mini 0805 which has a smaller field of view (120°). First of the Mini series, the 0801 is based upon a 2 Megapixel (MP) Omnivision OV2710 sensor and an Ambarella A2 processor. Its characteristic shape with the 1.5″ screen and the optional GPS receiver in the detachable mount laid the foundation for the Mini series’ success, due to its simplistic elegance, usability, and discreetness. It also delivered good quality 1080p video and was quite reliable. As technology progressed, better versions with newer hardware were developed. However, the Mini 0801 remains available for sale. If you’re interested in getting the original, you can acquire it at Geekbuying or Amazon (link goes to amazon.com – click here for vendors in countries other than the US). The successor of the Mini 0801 supports a higher video resolution (2304×1296). It uses the same casing, but the hardware inside is newer. This device is based on an Aptina AR0330 sensor and an Ambarella A7LA50D processor. The Mini 0803 has meanwhile gone out of production and has been replaced by the Mini 0805. Apparently, it was quite prone to overheating. The Mini 0805 is widely considered to be superior. The Mini 0805 is an updated version of the Mini 0803. It uses the same casing as its predecessors, but it has a better sensor (Omnivision OV4689, 4 MP) and processor (Ambarella A7LA50) and thus delivers superior video quality. The Mini 0805 can record at up to 2560×1080 resolution, at a bit rate of 13 Mbps. Also, this camera is more heat resistant and therefore more reliable than the Mini 0803. With a maximum SD card capacity of 128GB, it can record over 19 hours of high definition video. Note that the Mini 0805 has a smaller field of view (120°) than the other Mini cameras. This continues to be one of the best selling dashboard cameras in 2016. At the time of this writing, you can get this camera for as little as $70 at GearBest. Note that for a limited time only, GearBest are offering an 18% discount if you enter the coupon code CAR18OFF at checkout. The first Mini series model to use a different casing. Just as the Mini 0805, the Mini 0806 is based on an Omnivision OV4689 4MP sensor and an Ambarella A7LA50 chipset. It records up to 2560×1080 pixels at a bit rate of 21Mbps. It also supports 2304x1296p and 1920x1080p resolutions. This device is currently cheapest at GearBest (18% off with coupon code CAR18OFF). The Mini 0807 has just been released (April 2016). It is based on a Sony IMX322 sensor combined with an Ambarella A7LA50 chipset. It comes with a built-in super capacitor rather than a battery for improved temperature resistance and better reliability. Just as the Mini 0806, it can take up to two 128GB memory cards and loop record between them (cards not included). Also, the Mini 0807 supports a buffered parking mode. It can be powered either through the OBD-II port or by the car’s cigarette lighter. We don’t have a full review of this camera yet as it has just recently been released. Currently, you can order this camera from various vendors on Amazon. The Mini 0826 was released in 2016 and features an OV4689 sensor and an Ambarella A7 chipset. It is the largest of the Mini series thus far. This camera only supports memory cards up to 64GB. Some models additionally have 8GB internal memory, which will be useful in circumstances when you don’t have an SD card handy. So if, for example, you forget to take your SD card with you when going for a drive, the camera will still work. The Mini 0826 is currently cheapest at GearBest (18% off with coupon code CAR18OFF). The Mini 0901 was released in 2015, but has been discontinued because of problems with the GPS module. It used to be called Mini 0809, but was then renamed, reportedly to avoid confusion because it used a different chipset than the previous Mini cameras. This camera recorded at a maximum resolution of 1080p@30fps. It supported Wi-Fi and was based on an OV2710 (2MP) sensor and an AIT8427P chipset. One of the newest of the Mini series, the 0902 was released in 2016 and features an attractive new design, reminiscent of the more expensive BlackVue series. This camera is based on an OV4689 (4MP) sensor and an Ambarella A7LA55 chipset. Unlike the other cameras of this series, its GPS unit is external and isn’t integrated in the mount. It doesn’t have a screen either, but it supports Wi-Fi, so you can control the camera and view the video footage with your smart phone. This camera is currently out of stock. Apparently there were issues with the first batch of units released. The Mini 0902 should become available again once these issues are sorted out. At 66x33x40mm, this is the smallest camera of the Mini series. It would be hard to make these dash cams much smaller while keeping the 1.5″ screen. The Mini 0903 uses a Sony IMX322 (2MP) sensor and a Novatek NT96655 chipset. It records excellent 1080p resolution video at a bit rate of 20Mbps. This camera has a built-in super capacitor instead of a battery, increasing its lifespan and reliability at extreme temperatures. Also, it supports an un-buffered parking mode that will continuously record at a low frame rate when the car’s ignition is off, and record 15 seconds of normal video when an impact is detected. The Mini 0903 is currently cheapest at GearBest (18% off with coupon code CAR18OFF). So Which Mini Dash Cam Is The Best? Looking for cutting edge technology? The Mini 0903 is the smallest & stealthiest of the lot, looks really sharp, records great video, and has a super capacitor that should make it quite reliable even in hotter or colder climates. If you prefer a time-tested camera that has sold lots of units and that most customers are happy with, get the Mini 0806. It’s the most expensive of the series, but it also has the best features such as great quality 2560x1080p video, high memory capacity and bit rate, and optional CPL filter for reduced glare from sunlight. In case you’re looking for an alternative to the Mini 0806 that’s a bit more economical but still records good quality video, the Mini 0805 is also a great option.